Week #1 proved to be a pretty decent bite. 36 walleyes were weighed in for 108.375 lbs. Big fish of the night was a 7 lb 9 oz walleye caught by team Weckwerth and Stone. Anderson/Reiffenberger took first place with 17.125 lbs. Second place went to Weckwerth/Stone with 15.1875 lbs. Third place was Heinrich/Heinrich with 15. 125 lbs. Fourth place was Weber/Ruth with 10.1.25 lbs. Fifth place was Broin/Zimbelman with 8.375 lbs. Rounding out the top 6 was Joyce/Larson with 7.375 lbs. There were 28 walleyes caught during week #2 for 68.125 lbs. Big fish of the night was caught by Longnecker/Longnecker with a 5.3125 lb walleye. Streich/Tobias took first place with 10.125 lbs. Second place went to Randall/Winson with 9.3125 lbs. Third place was Longnecker/Longnecker with 8.75 lbs. Fourth place went to Spray/Spray with 8.6875 lbs. Fifth place was Dahle/Jahn with 7.125 lbs. Rounding out the top 6 was McGinty/Miller with 6.5625 lbs. There were 39 walleyes caught during week #3 for 75.5875 lbs. Big fish of the night was caught by Pringle/Olson with a 3.625 lbs walleye. Jerve/Ohmacht took first place with 11.5625 lbs. Second place was Dahle/Jahn with 8.75 lbs. Third place went to Spray/Spray with 7.4375 lbs. Cornelius/Roder took 4th place with 5.875 lbs. Fifth place was Randall/Winson with 5.6875 pounds. Rounding our the top 6 was McGinty/Miller with 5.0625 lbs. There were 39 walleyes caught during weej #4 for 86.6875lbs. Big fish of the night was caught by Weber/Ruth with a 5.13 lb walleye. Weber/Ruth took first place with 12.5 lbs. Second Place went to Spray/Spray with 12.25 lbs. McGinty/Miller took third place with 9.375 lbs. Fourth place went to Jerve/Omacht with 7.3125 lbs. Fifth place was Dahle/Jahn with 6.875 lbs. Sixth place went to Weckwerth/Stone with 6.875 lbs. It was a tough bite for all the teams and only 10 fish were brought to the scale for a total of 19.375 pounds. Big fish of the night was caught by Cornelius/Roder, a 2.875 lb walleye. Jorgenson/Schuler took first place with 4.875 lbs. Second place went to Cornelius/Roder with 2.875 lbs. Third place was Enger/Hauck with 2.5625 lbs. Fourth place was Jerve/Omacht with 2.125 lbs. Fifth place was Dahle/Jahn with 2.0625 lbs. Sixth place went to Ludvigson/Zupan with 1.9375 lbs. Another tough week of fishing, with only 6 walleye weighed in. Big Fish of the night was a 6.6875 lb walleye caught by Halvorson/Halvorson, but they were not in the big fish pot. So, Joyce/Larson took the big fish money with a 3.125 lb walleye. First place went to Halvorson/Halvorson with 6.6875 lbs. Second place was Zupan/Ludvigson with 3.9375 lbs. Third place was Joyce/Larson with 3.125 lbs. Fourth place was Spray/Spray with 1.875 lbs. Fifth place went to Dahle/Jahn with 1.4375 lbs. Rounding out the top 6 was Pringle/Olson with 1.375 lbs. Next week will be the final week of fishing league. League was cancelled due to the weather and will not be made up. This years league champions were Eric and Adam Spray. Second place was Steve Dahle and Jamie Jahn. Third place was Josh Weckwerth and Dustin Stone. 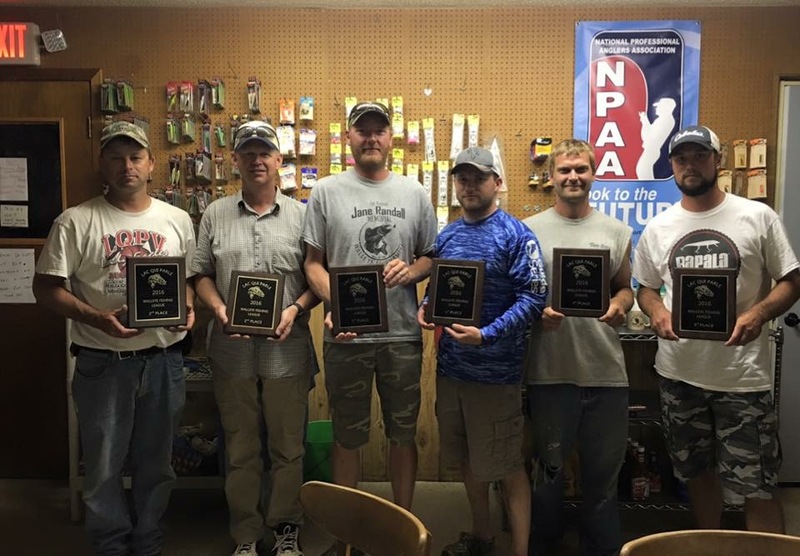 L to R: Jamie Jahn, Steve Dahle, Eric Spray, Adam Spray, Josh Weckwerth and Dustin Stone.